Cisco catalyst 2960-X series and 2960-XR switches were designed as the greenest and popular switches for branch offices and campus. Cisco also described the new Cisco 2960-X Series as Simple, Smart, Scalable, Green, Highly Secure, and Cost-Effective one. How to prove that? There is a test report about WS-C2960X-48TD-L and WS-C2960XR-48TD-I from Miercom. What are the conclusions and main features? Let’s have a look. Cisco’s Catalyst WS-C2960X-48TD-L and WS-C2960XR-48TD-I Gigabit Ethernet switches were evaluated by Miercom under the Certified Green program for power consumption and energy. Note: Overall environmental impact and business-enabling green benefits of the Layer 2 and Layer 3 switches were also analyzed. The Cisco Catalyst 2960-X and 2960-XR switches are designed to be used in branch office/campus environments. The 2960-XR switches support static and dynamic routing of Layer 3 traffic and have a field replaceable, hot swappable modular power supply. Using a 1518-byte frame size with 100% Layer 2 traffic load, testing showed both switches to be 55% more efficient in power consumption, measured in Watts/ Gbps, than the Industry Average. Hands-on testing and analysis proved the C2960-X and C2960-XR to be highly economical, easy-to-manage and energy-efficient Layer 2 and 3 switching solutions. Cisco EnergyWise, Switch Hibernation Mode, Downlink Hibernation Mode, a wide temperature operating range and variable-speed cooling fans. All switches in the C2960-X Series are stackable via the optional FlexStack-Plus hot-swappable module. The maximum number of units that can be stacked is eight. The C2960-X and C2960-XR switches utilize the IEEE 802.3az (EEE) feature, allowing energy saving during periods of low link utilization. Testing verified that with EEE enabled, the C2960-X model reduced power consumption by up to 29.3% (13.1 watts) and the C2960-XR model saved 31.4% (13.6 watts) of power. The new Cisco Switch Hibernation feature allows the C2960-X and C2960-XR switches to sleep when idle or with very low traffic. It is programmable and can be configured on daily work schedules. Cisco Switch Hibernation can be controlled by either using a local console on the switch or from a central location by using the Cisco EnergyWise management solution. For the Cisco Switch Hibernation test, a sleep schedule was configured. Cisco Switch Hibernation reduced the power consumed for the Catalyst 2960-X model by 84% from 44.3W at link idle to 7.2W at idle. Similarly, tests showed that for the C2960-XR, power consumption was reduced by about 81% from 43.7W at link idle to 8.4W. The switches remained in Hibernation mode until scheduled for wake up. The switches can be awakened earlier than scheduled by simply pressing the mode button on the front of the unit. Cisco EnergyWise manages energy usage of devices on networks. It monitors, controls and reports energy use of IP-connected equipment. It is also used to configure the power-saving features, such as Cisco Switch Hibernation, in the C2960-X and C2960-XR switches. The power profile shows the energy used by the switches handling Layer 2 traffic with various loads using 1518-byte frame size with EEE disabled. The C2960-X used 15.3 watts at initial boot and 44.3 watts at idle with link. Energy use slightly increased as the traffic load increased. Power consumption measurements of the C2960-X switch using Layer 2 traffic across various frame sizes under varying loads and conditions. The C2960-XR used 22.6 watts at initial boot and 43.7 watts at idle with link. The Cisco Catalyst 2960-X and 2960-XR 48-port switches were tested using Layer 2 and Layer 3 traffic with 64-, 128-, 256-, 512-, 1024-, 1518-, 9216-byte and IMIX frame sizes. The power consumption was measured while the switch was booting, during switch hibernation and at idle with no link and 10%, 30%, 70% and 100% traffic load. All measurements were done with EEE disabled. All 48 ports on the C2960-X and the C2960-XR support EEE. With EEE enabled, power use was reduced during times of little or no network traffic. EEE was tested by sending Layer 2 traffic with varying Inter-Burst Gaps (IBG) between each burst of 1,000 frames. It was observed that the length of the IBG impacted power consumption. The longer the IBG, EEE was more effective with less power consumption. The C2960-X and the C2960-XR were tested with EEE enabled and disabled modes. The maximum power savings between EEE enabled and disabled occurred with an IBG of 100ms. It was 13.1 watts (29.3%) for the C2960-X and 13.6 watts (31.4%) for the C2960-XR. Miercom measures and keeps track of trends in the industry average values for power consumption on networking products. These calculations consider frame size in the traffic mix – preferably IMIX, traffic utilization percentage, and available uplinks and modules. 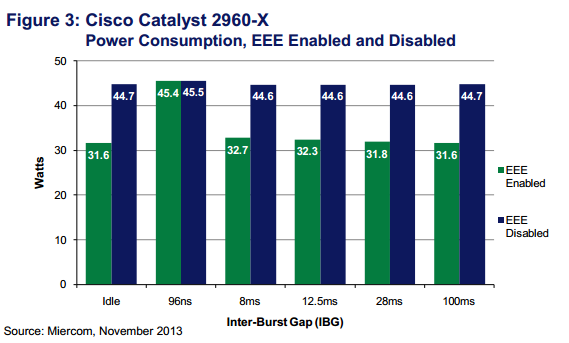 For the C2960-X switch, the maximum power savings between EEE enabled and disabled occurred with an Inter-Burst Gap of 100ms. The savings was 13.1 watts. A 64-byte frame size was used. Power consumption measurements of the C2960-XR switch with Layer 2 traffic using various frame sizes under varying loads and conditions. The industry average also involves the latest available products on the market. End of life cycle (EOL) products, once previously included in the averages, have been removed. 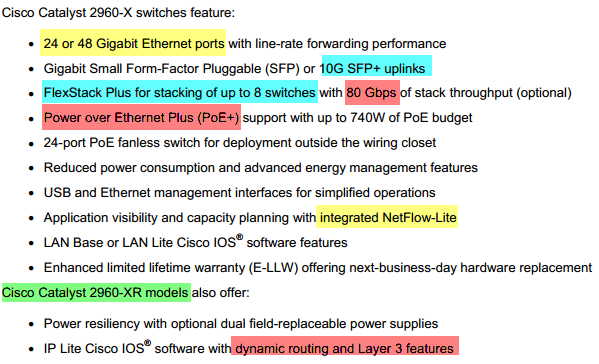 It is reasonable to expect the average industry power consumption for Ethernet switches to change over time. The performance of each switch was compared to the Industry Average using Watts/Gbps at 100% load and Layer 2 1518-byte frame size. The C2960-X consumed 0.66 Watts/Gbps, while the C2960-XR switch consumed 0.65 Watts/Gbps. 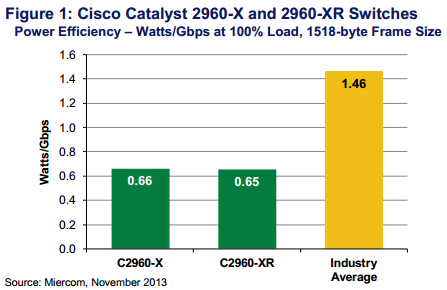 Compared to the Industry Average, both switches use less power to provide greater throughput. The C2960-X switch used 29.0% less power with the C2960-XR using 30.1% less. The power efficiency of the two switches was the same as we observed equivalent throughput for both. The throughput of the C2960-X was 67.11 Gbps and 67.85 Gbps for the C2960-XR. The wide temperature operating range of the C2960-X and the C2960-XR, which is 0° to 113° F (-5° to 45° C), contributes to a reduction in power consumption. When cooling is needed, it is provided by variablespeed fans. Therefore, in addition to power consumption being minimized, reduction of noise in the workplace is an added benefit. Business Processes: Cisco reduces waste output by engineering products that use fewer materials to operate. Cisco products can be upgraded, refurbished and recycled instead of being disposed, thereby decreasing landfill waste. 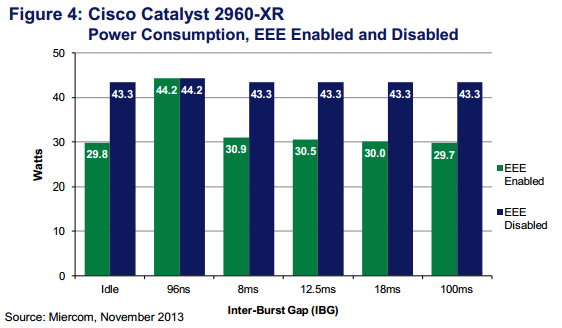 Maximum power savings between EEE enabled and disabled for the C2960-XR switch using 64-byte frame size occurred with an Inter-Burst Gap of 100ms.The savings was 13.6 watts. Annual cost to operate the Cisco Catalyst 2960-X switch was calculated to be $19.37, a savings of $19.09 from the Industry Average of $38.46. 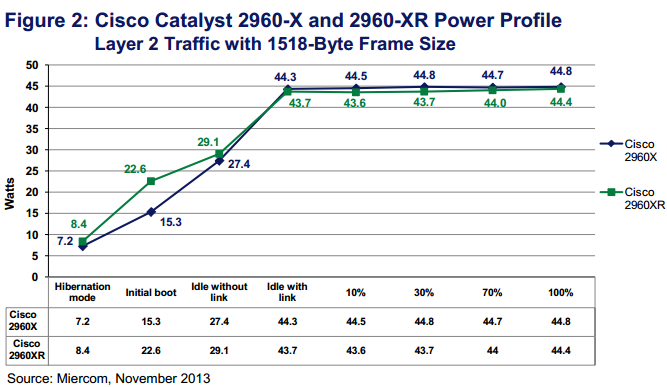 The Catalyst 2960-XR costs $19.11 to operate, a savings of $19.35 compared to the Industry Average. Both the C2960-X and the C2960-XR switches save 50% in annual costs when compared to the Industry Average. Cisco aims to reduce both operational and environmental costs by offering new ways of communication and manageability. The company believes that it is necessary for employees in disparate locations to collaborate productively on work, a green alternative to travel, to reduce emissions and keep the environment sustainable. Cisco’s green innovations include Cisco EnergyWise and SmartGrid. Cisco’s intent is to increase customer awareness of how to lower equipment operating costs and to minimize the carbon footprint of its products. Cisco’s EnergyWise Suite saves power by controlling power consumption of network devices directly and other network connected devices including phones, printers, monitors, virtual servers, HVAC systems and more – not just the Cisco devices. SmartGrid is a combination of products, technologies, services and business partners that optimize communication, improve resiliency and reduce the operational cost and complexity of the energy grid. Cisco’s EnergyWise Management software now manages on-premise and cloud-based enterprise energy management platforms, further reducing operating costs. Reducing the amount of paper, plastic and metal that ship with products, Cisco has replaced these materials with more environmentally friendly solutions, such as using 100% recyclable materials and removing non-essential materials including magnets, rubber feet and generic cables. The annual running cost is calculated based on the assumed use of the switch in a branch office environment. The switch was calculated to operate 12 hours daily during the typical work week. Of those 60 hours, it would operate 100% for 10 hours and at 70% for the remaining 50 hours. For the other 108 hours (48 hours on the weekend and 12 hours each weekday), the switch would be considered idle/ready. For the annual cost calculation, two power measurements were used; traffic running at 70% and 100% of capacity with EEE disabled. 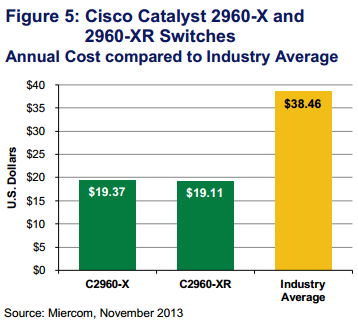 As shown in Figure 5, both the Catalyst 2960-X and 2960-XR significantly lower annual running costs when compared to the Industry Average. The approximate annual savings is $19.09 for the C2960-X switch, which is a 49.6% savings compared to the Industry Average, and a savings of $19.35, or 50.3%, for the C2960-XR. Industry Average is based on the testing of 48-port 1GE switches (non PoE) with fiber uplinks and 1GE copper interfaces. 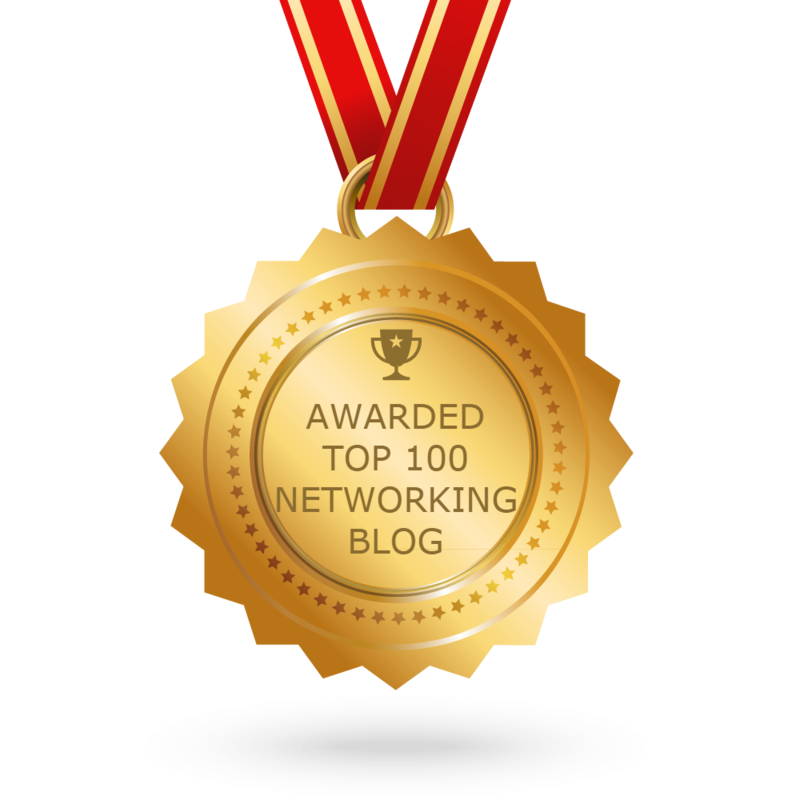 Vendors with products included in the Industry Average calculation include Brocade, Cisco, Dell, D-Link, Extreme, HP and Netgear.